Yesterland recently published “They’re Back! 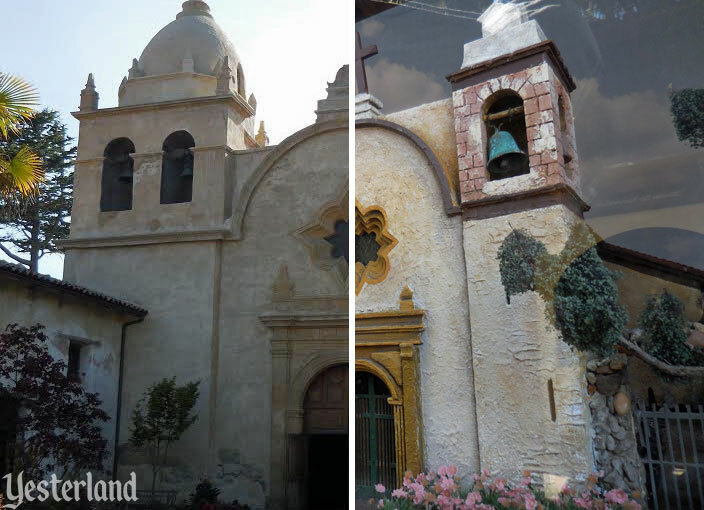 The Missions Return to Knott’s Berry Farm,” thanks to photos and observations from M.H. Habata. Today, M.H. Habata is back with photos that show how eight models at Knott’s compare to their full-size counterparts. , Curator of Yesterland, December 30, 2016. 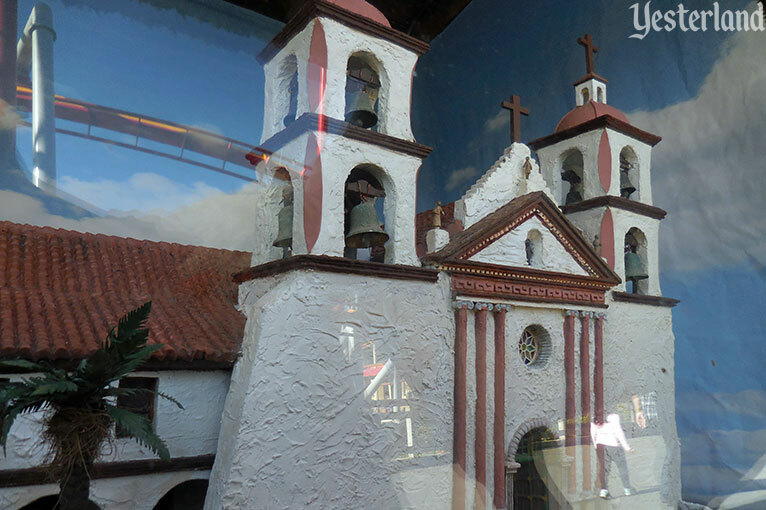 Knott’s calls its missions “scale models.” But is that really what they are? The missions more-or-less follow G Scale (technically 1:22.5), with one inch on a model equaling around two feet. However, it would be more accurate to call them artistic interpretations than scale models. 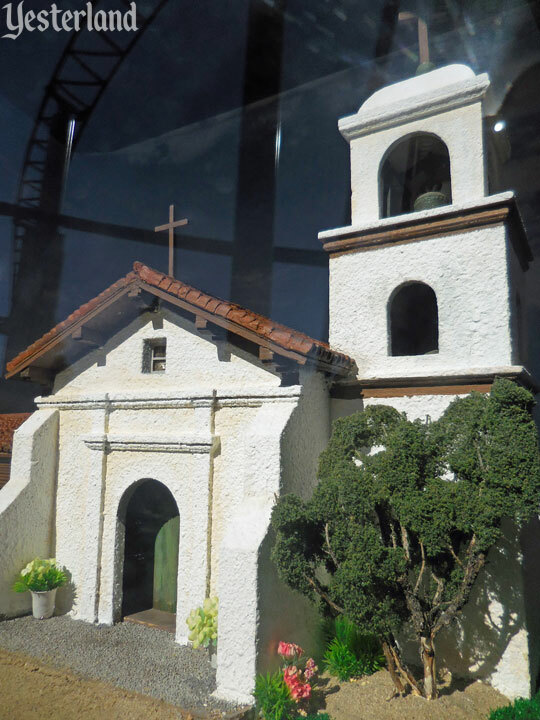 In the 1950s, Walter Knott commissioned artist Leon Bayard de Volo to create the California Mission dioramas. The artist worked in the tradition of Hollywood scenic design—something he was familiar with professionally. 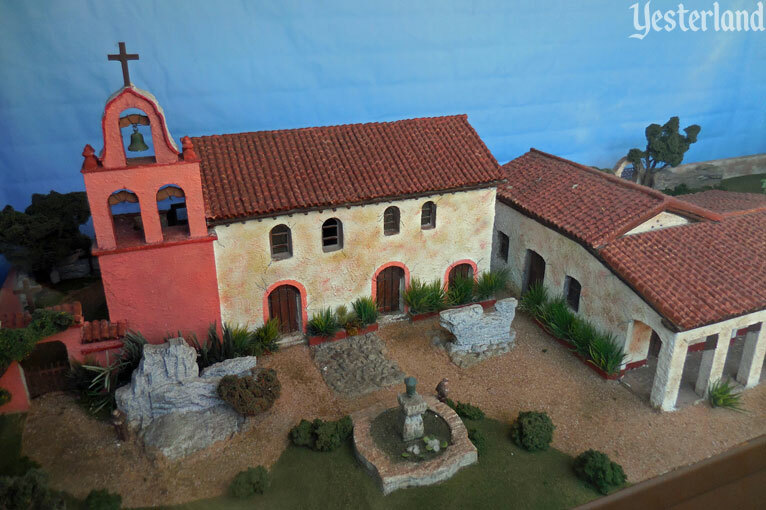 It was his third set of California Missions models. Using how the 21 missions looked from the late 1930s to the early 1950s as his starting point, Bayard de Volo distilled them to their most recognizable features—their front facades, arcades, campanarios (bell walls), towers, and crosses. He adjusted proportions, enlarged smaller elements, pushed features together, and mostly omitted the missions’ living quarters, support facilities, and large courtyards—making models that would fit the display cases. Bayard de Volo added Hollywood-style embellishments to his “shrink and edit” versions, including small figurines of monks in robes and villagers in rural Mexican attire, to give a historical appearance. Each model had to “read” well from the front, but guests would not see the back. In 2013, Knott’s management assigned their master wood carver, Bob Weir, to the job of restoring 16 surviving models from the 1950s. Weir repaired decades of damage and deterioration, updated details, and added more sumptuous landscaping. For five models that had been lost, Weir built replacements in the style of Bayard de Volo, basing them on how those missions look today. At the request of management, Weir finished the unfinished backs of the models—although guests can once again only see them from the front. 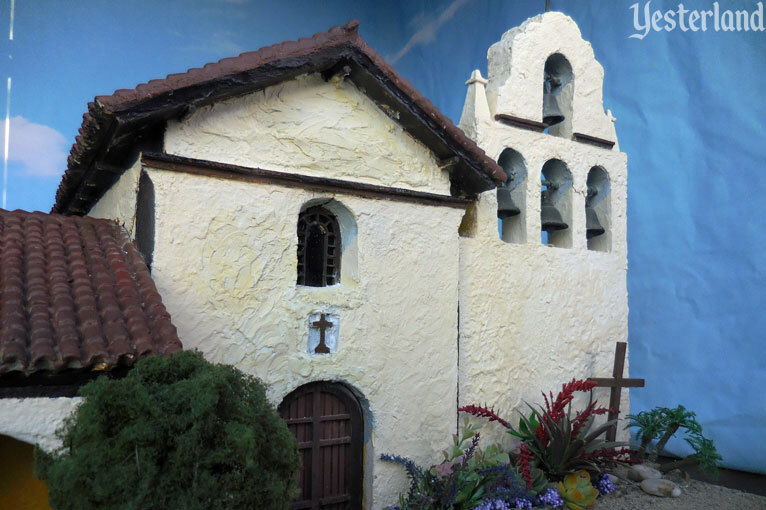 The California Mission models at Knott’s are good showmanship—not scholarly representations of the missions in the decades when the Spanish Padres built and ran them (which would have been a moving target anyway). They are works of art—a collaboration between two artists working almost 60 years apart. Let’s look at how these artists represented the actual missions as models. 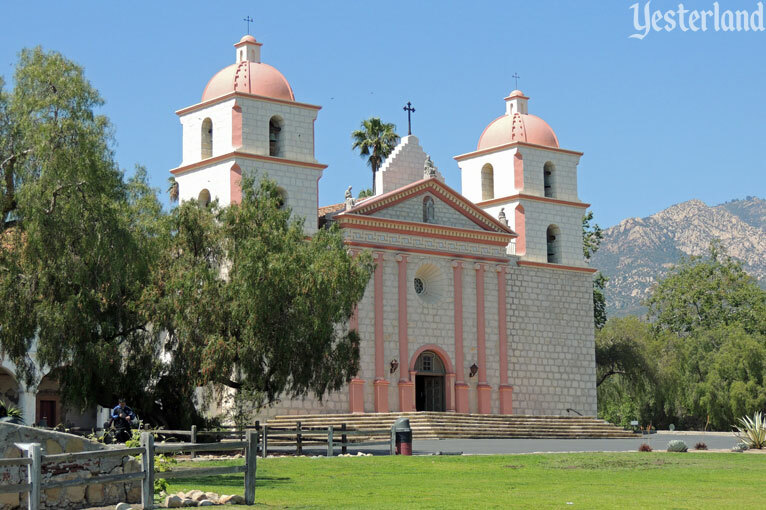 Known as the Queen of the Missions, Mission Santa Bárbara has two nearly identical towers—unusual symmetry for a California Mission. Since late 1953, the front of the real church has been neatly-cut Santa Maria limestone over concrete. Before that, it was a rock wall covered with a coat of plaster. The model at Knott’s still represents the earlier look. 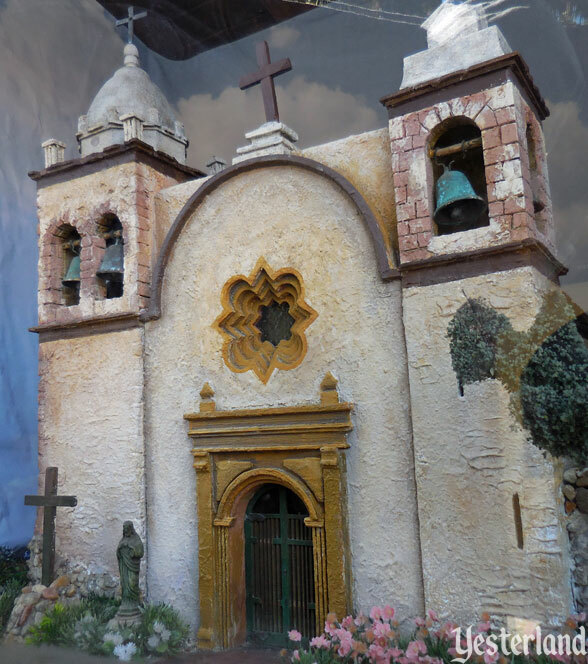 In the photos, the campanario (bell wall) at the real Mission Santa Inés has three bells, but the one in the model has four bells. Once again, it’s because missions go through changes. The original three-bell campanario at Santa Inés collapsed in 1911. Its replacement had four bells. That one was replaced in 1948 with a new three-bell version, to restore the earlier appearance. Because it’s a Bayard de Volo original, the Knott’s model represents 1911 to 1948. 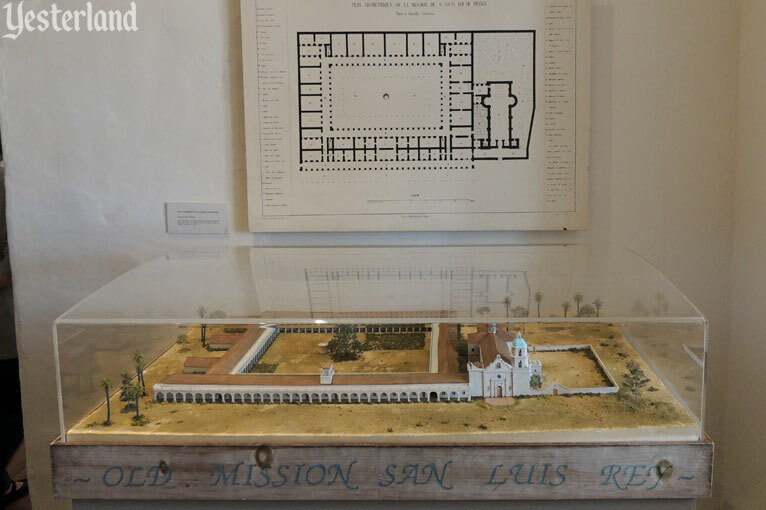 Mission La Purísima Concepción is sometimes nicknamed the “Linear Mission.” The challenge of making a model to fit a fairly narrow case, while still maintaining the scale of the other missions, resulted in an extreme “shrink and fit” representation. Notice how the doors and windows have been pushed together. The perpendicular wing on the model is beyond the right edge of the photo of the real mission. 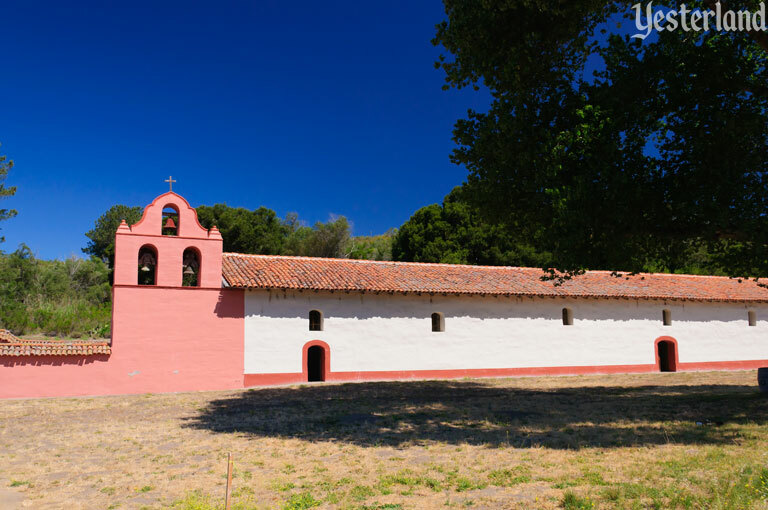 At first glance the two photos of Mission San Luis Obispo look similar. But notice how the model’s front-to-back proportions are shallow. The year 1772, the cross, the arches, and the bells have been enlarged. That doesn’t mean the model is bad; it means the Knott’s model emphasizes the details more than a traditional scale model would. You may know it as Carmel Mission. The sign at Knott’s calls it Mission San Carlos Borromeo. 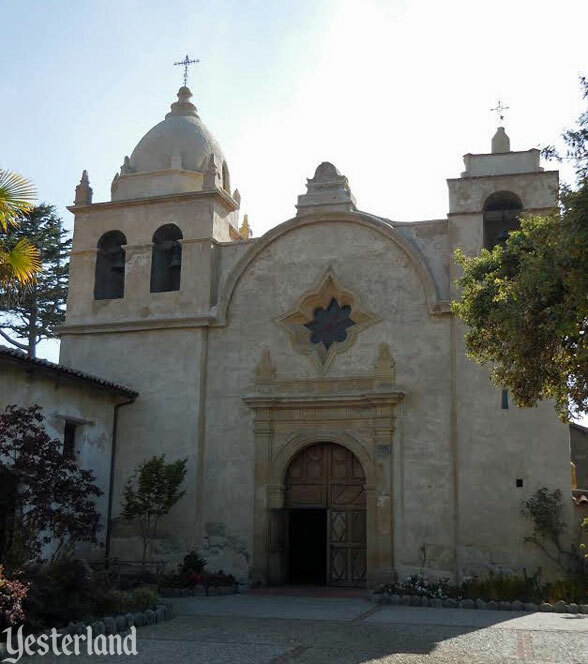 Its full name is Mission San Carlos Borromeo de Carmelo, so both are correct. 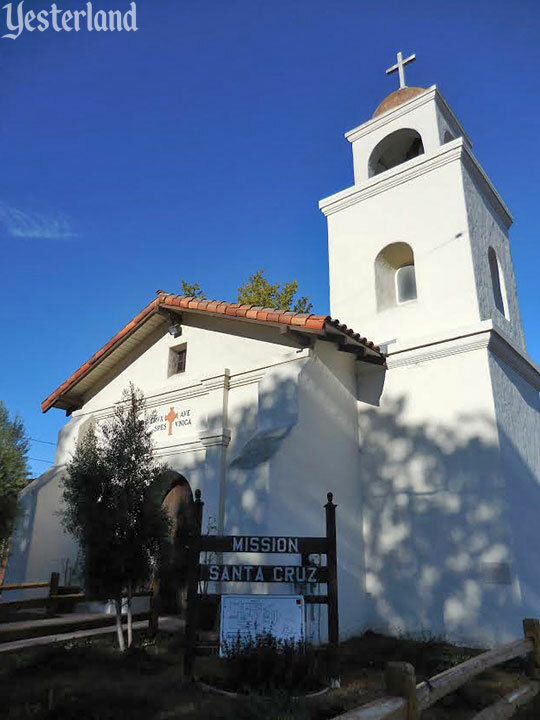 Of all the pairs of photos in this articles, the real Mission Santa Cruz and its counterpart at Knott’s are the most similar to each other. The biggest differences are the proportions of the elements of the tower. 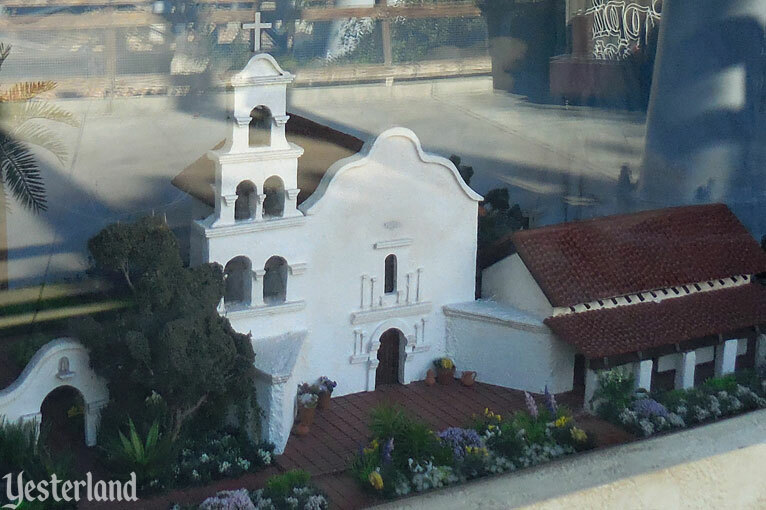 The photos of Mission Santa Clara above suggest that the color of the architectural ornamentation at Knott’s is wrong. But that’s not the case. 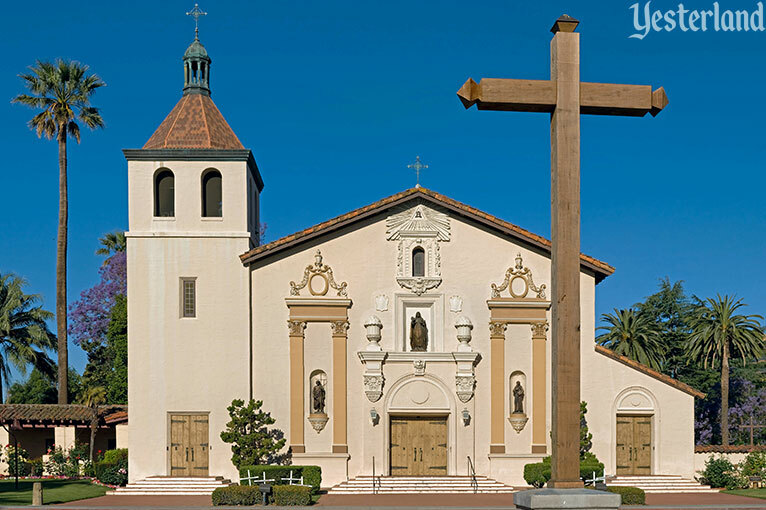 Located on the campus of Santa Clara University, the real church is currently painted like the model at Knott’s. The “real” photo from 2008 shows an earlier paint scheme. 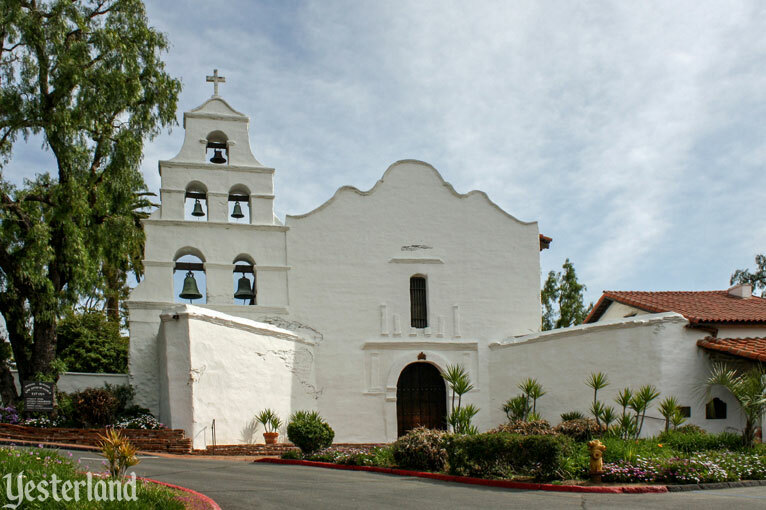 The California Missions have changed over the centuries, and continue to evolve. 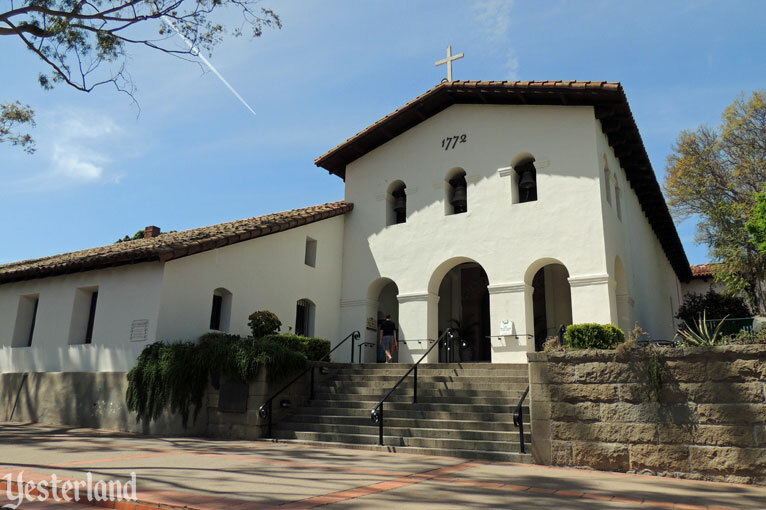 A few are California State Historical Parks, but most still function as Catholic institutions—“living” churches, monasteries, and schools that change over time—sometimes by choice and sometimes due to catastrophes such as earthquakes. Knott’s faces an interesting challenge. 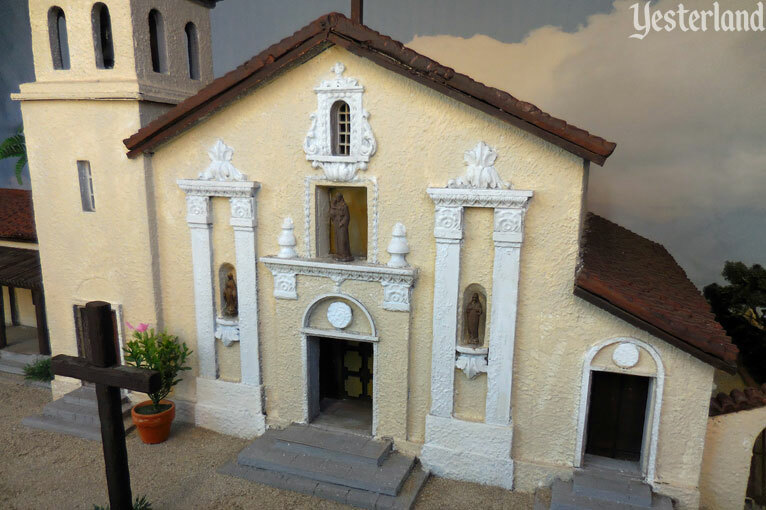 Which time period should the mission dioramas represent? A specific point in history, such as the 1830s, when the Mexican government confiscated the mission properties and exiled the Padres? Or the 1860s, when President Lincoln returned the missions to the Catholic Church? Or the 1930s through 1950s, when Bayard de Volo created the dioramas for Knott’s, after creating two earlier sets? Or should they reflect how the missions look today? Historically accurate 19th century models would require starting over. 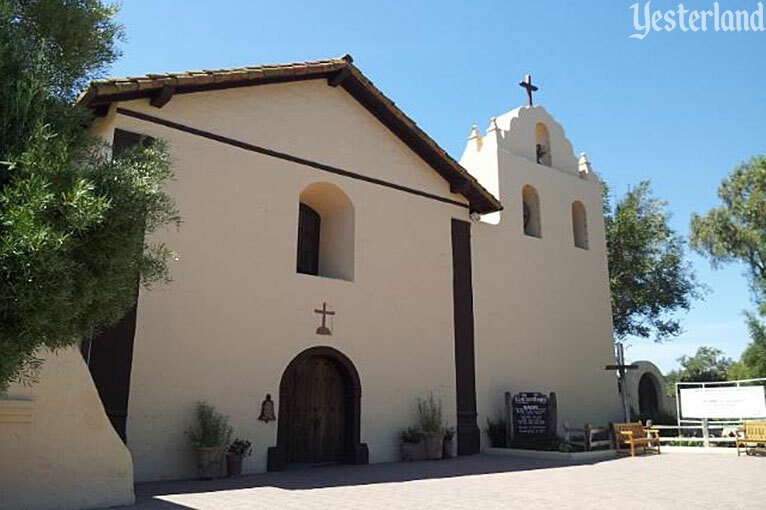 Experienced historians specializing in California Mission history would have to call the shots. That won’t happen—and it shouldn’t. Knott’s is a theme park, not a history museum. Presenting the dioramas exactly as Bayard de Volo created them in the early 1950s is not an option either. It’s no longer the same set. Bob Weir’s work was more than a restoration. He salvaged what he could from the original set of missions, but did substantial new work. Ideally, the models should reflect the current appearance of each mission in a timeless way. 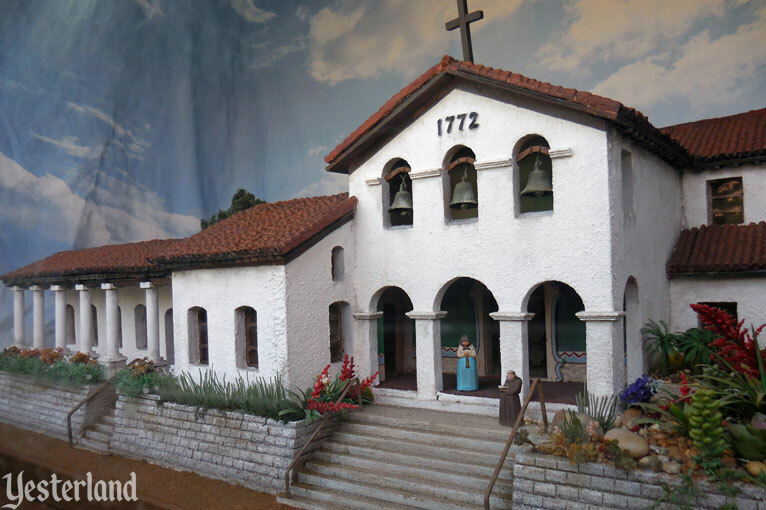 I hope this article has inspired you to visit the California Mission models at Knott’s Berry Farm. In addition, consider making it a goal to visit the actual missions. Regardless of your religion (or absence of religion), the missions are fascinating—as history, architecture, art, and time machines to the past.